A low-sugar recipe from Sarah Wilson, bestselling author of I Quit Sugar. The perfect guilt-free sweet treat for anyone who's trying to cut down on sugar but still needs a chocolate fix. A low-sugar recipe from Sarah Wilson, bestselling author of I Quit Sugar. The perfect guilt-free sweet treat for anyone who's trying to cut down on sugar out but still needs a chocolate fix. ​To make the crust, melt the coconut oil and rice malt syrup in a saucepan. Remove from the heat, add the shredded coconut and cacao powder and mix well. Meanwhile, heat the coconut cream, cardamom pods and vanilla in a saucepan to a simmer, then turn off the heat and cover with a lid. Allow to steep for 10 minutes. Strain the coconut cream mixture into a bowl, reserving 4 tablespoons in the pan for emergency use later, if needed. Discard the cardamom pods (or save to spice up chai tea). Add the chocolate and salt to the bowl, whisking it through until silky and melted. If the fats separate and your ganache develops a chocolatey cottage-cheese appearance, just add the reserved coconut cream, whisking swiftly to bring it all back together. Once silky, pour into the tart shell and refrigerate until the ganache sets (at least 2 hours). Garnish with a pinch of coarse sea salt berries and petals, if desired. 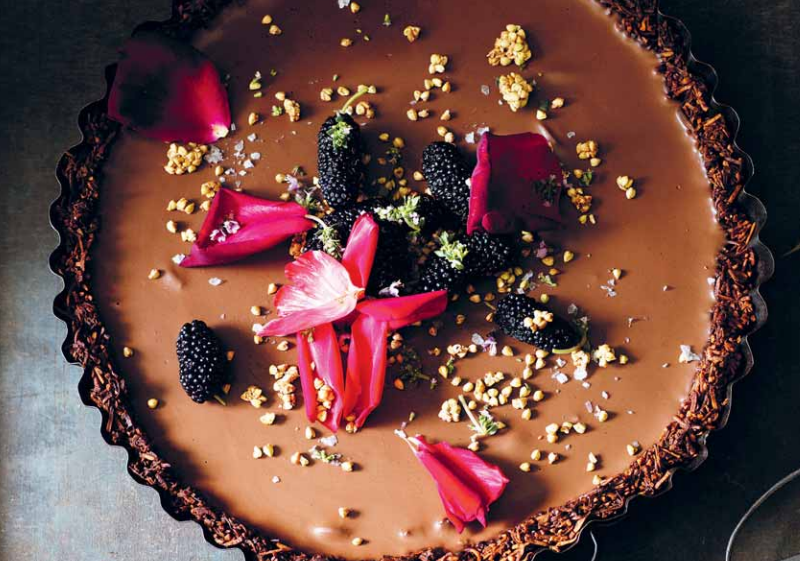 Discover more guilt-free sweet treats from Sarah Wilson in I Quit Sugar: Simplicious.